It’s pretty rare to find something that costs so little and yet still manages to pack in so much value. Such is the case with the Kusonkey Multi-function 7mm-19mm Universal Socket Adapter, which is probably one of the best little gadgets we’ve come across in recent memory. 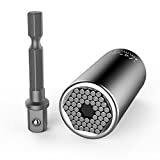 This simple device replaces your entire socket wrench set with a single tiny socket tool that can attach to a standard handle or even your electric drill. The adapter is filled with retractable metal pins that can grip any nut between 7mm and 19mm in size. Trust us, you’re going to love it.